Great news for the Wild West enthusiast! The immortal Western myth in new edition. The current versions of the classic lever action combine the latest technology with timeless beauty. Just the name WALTHER embodies over 100 years, the successful fusion of tradition and innovation. The proven and reliable construction Lever Action has taken on the current state of technology with the 88 g CO2 cartridge. 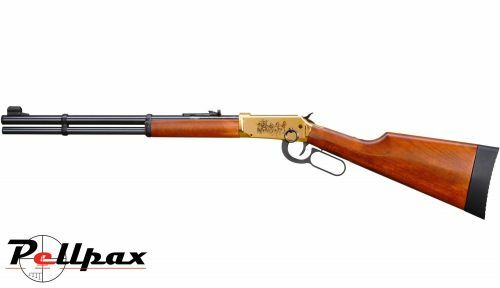 Gold metal - wood stock and grips - replica of a western lever action Winchester, but its a powerful CO2 cylinder powered air rifle. - Barrel Length : 38cm. Add this item to your basket & spend an extra £120.01 to apply for finance.